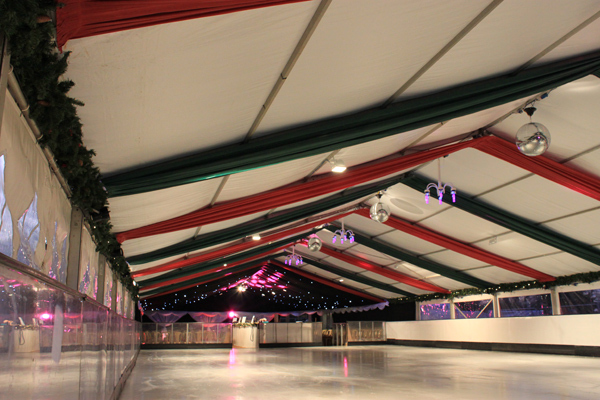 Enjoy skating on a REAL ICE rink from ABC Marquees! Provided in partnership with Cities On Ice, our ice rinks are carefully prepared and constructed using REAL ice. It takes around 4 days to create the rink, whether open-air or covered, and it can be kept at freezing point as long as you may require. Windsor On Ice – our stunning ice rink venue featured at Windsor Castle over the Christmas period – was open to the public for over 3 weeks in 2011! Available in various sizes, supplied with skates and barriers plus music and disco lights, audience seating and catering if required, ice rink hire from ABC Marquees is ideal for any special event – all year round. Please contact us for further details and pricing or find out more about the construction process here.